California billionaire and political activist Tom Steyer has scheduled an October fundraiser for 9 Democratic challengers for seats in the U.S. House, most of whom have been silent on Steyer's pet issue of impeachment. Scheduled for October 13, Steyer and his wife will host a "Flip the House" event at their residence, where "guest" tickets go for $1,000, according to the website invitation. Four other tiers of tickets range from $2,500 to $24,300. All of the candidates featured in the fundraiser are either challenging incumbent Republicans, or are vying for open seats created by a lawmaker's retirement. Records searches for five of the nine candidates turned up no comment or position offered on the idea of impeaching President Trump, which is more likely if Democrats retake the majority in the House in the fall elections. Those candidates and their corresponding house district are Jessica Morse (CA-04), Josh Harder (CA-10), T.J. Cox (CA-21), Katie Hill (CA-25), and Mike Levin (CA-49). Two other candidates, Gil Cisneros (CA-39) and Katie Porter (CA-45), have generally said they support the investigation by special counsel Robert Mueller, and that decisions on impeachment should wait for a conclusion and report by Mueller and his team. Only one of the nine candidates appears to have vocalized direct support for impeachment. Harley Rouda, a real estate executive running for the 48th Congressional District in California, was asked at a March debate what the biggest threat to the United States was, and how should Congress protect against that threat. "Donald Trump, and impeach him," Rouda said. "I do believe Donald Trump is the greatest threat to our security right now. His behavior, his character, or lack thereof, his constant prodding and childlike behavior, is not acceptable for the presidency of the United States." A representative for Steyer said inferences should not be drawn between the candidate's stance—or lack of a stance—on impeachment, and getting Steyer's support. "Nextgen is working in 11 states and 30-plus congressional districts across the country and we've been clear impeachment isn't a litmus test," said Aleigha Cavalier, a spokeswoman for Steyer's NextGen America PAC. "California is one of those states." Steyer launched a nationwide TV campaign in October of 2017 called "Need to Impeach," before partaking in a series of town halls in 30 cities across the country. 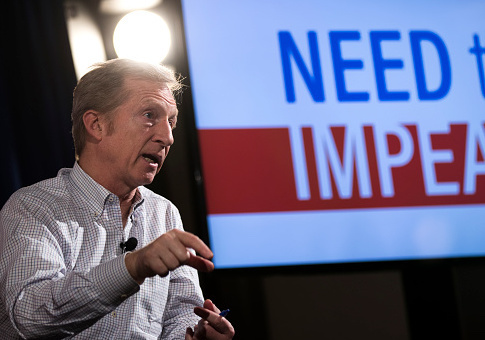 When the Washington Free Beacon attended the "Need to Impeach" town hall last February in Arlington, Va., one of Steyer's themes was to energize the Democrats' base and grassroots voters to encourage them in applying pressure to the party's elected House members. For example, Steyer made pointed remarks about Rep. Don Beyer, a Democrat whose district includes the Arlington area. "This is a heavily Democratic, progressive district," Steyer said in February. "So I would say to you, I don't know that much about Congressman Beyer, I'm sure he's a good person. I think you guys should ask him for the reason. I think it's a very legitimate question as constituents to ask, ‘If this is the number one issue of the day, what is it about this president that makes you want to put up with this kind of lawlessness for another day?'" About two months after the "Need to Impeach" campaign began, Steyer made a "major announcement" saying he would spend about $30 million to help Democrats take the House of Representatives. Yet for all of Steyer's largesse to the party, the ‘impeach' campaign has been a source of heartburn for many House Democrats. "Steyer doesn't care that Democratic leaders are worried that he could blow their chance at winning the House by talking up impeachment around the country and in his TV ads—though he argues he's actually helping Democrats," Politico reported in May. "He says he's the only person willing to tell the truth. And the thing about a self-made billionaire with nothing to lose: It's hard for anyone to convince him he might be wrong, or to get him to stop." More recently, some media reports have suggested many Democrats are persuaded in their own minds about going forward with impeachment, but are reluctant to talk about it openly. "The political reality is that Democrats are all but certain to impeach Mr. Trump if they take the House in November," the Wall Street Journal editorial pages said. "After what they've said and the process they've set in motion, Democrats won't have much choice. They simply don't want to admit this now before the election lest they rile up too many deplorables and independents who thought they elected a President for four years." Former secretary of state John Kerry, also the Democrats' nominee for president in 2004, said impeachment talk should be off the table. "I'm not advocating impeachment," he said. "I think we shouldn't even be talking about it. There should be nothing. The word shouldn't be used right now. What we need to do is focus on the real choices of American politics, the values that are being violated, and then see what happens, see if (special counsel) Robert Mueller comes out with something or doesn't. … I think you have to let the investigation run its course, and then we can measure all of this appropriately." Kerry's remarks were reported by USA Today, which came under a sub-headline of, "Democrats shouldn't say the I-word, at least not now." This entry was posted in Politics and tagged House Democrats, Tom Steyer. Bookmark the permalink.